The MFEE Fundracer Sequel 2017 captured the essence of the Montclair community: Team Frick and Frack wins 4 1/2 hour marathon endurance race across Montclair. Sequels are rarely better. After the first MFEE Amazing Fundracer in 2016, expectations this year for the newly emerging annual tradition were high. This was for good reason. 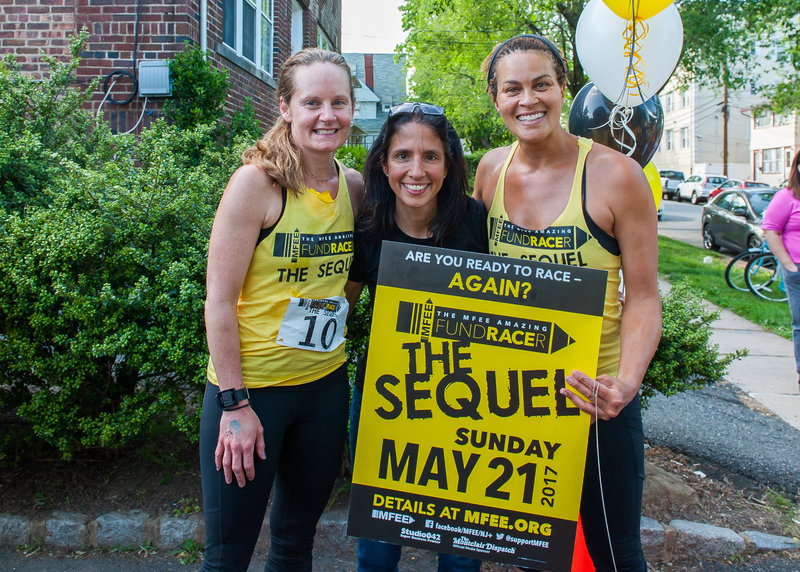 The first Fundracer, in 2016, was a resounding success under the newly appointed Executive Director, Masiel Rodriquez-Vars, the event perfectly tapping into the good natured competitiveness and community that Montclair provides so bountifully. And after all the fun was done, the Montclair Fund for Educational Excellence, MFEE, had raised over $70,000 for Montclair Public Schools. The Fundracer concept was the brainchild of the newly appointed Executive Director, Masiel Rodriquez-Vars and LeAnne Korbel. When the MFEE Amazing Fundracer: The Sequel was better, few were left surprised. Sunday’s event retained all of the intensity, amusement, drama and support and then some. 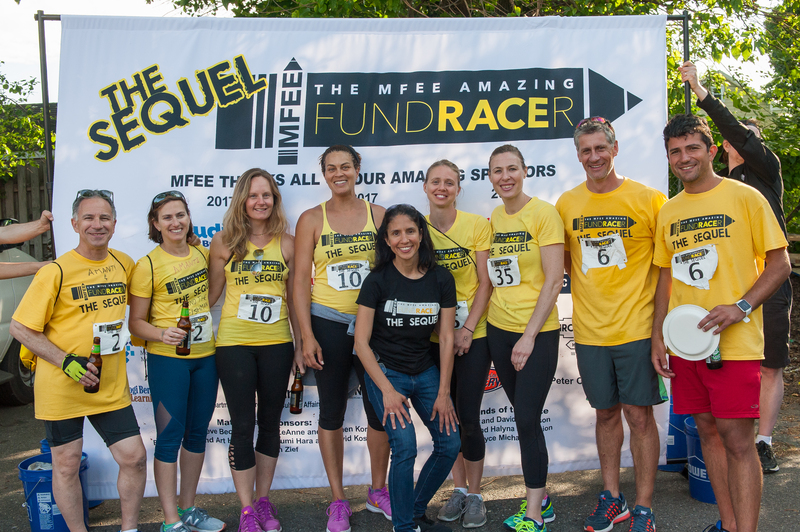 The final four teams in the 2017 MFEE Amazing Fundracer. Photo by Scott Kennedy for The Montclair Dispatch. The Montclair Dispatch provided complimentary portraits of each team, and the antsy atmosphere built up until the start at 1:00 PM. The teams pushed through the gates and into Yogi Berra Stadium, where each team had to find an envelope with their team name on it, hidden under one of the 3,784 seats. The competition is formatted much like the show The Amazing Race, wherein teams of two competitively race to different points where they must navigate various challenges for a clue to where the next location is. For this year’s event, the points were located at different places in Montclair such as Little Daisy Bakeshop and Glenfield School. After last year’s challenges included eating silkworm larvae and assembling a wheelbarrow, competitors were both nervous and excited for this year’s challenges. Team Frick and Frack, made up of Sarah Young and Kelley Reynolds, were the first place winners. Photo by Scott Kennedy for The Montclair Dispatch. That nervousness was well-founded, as the teams had to eat various concoctions of dried bugs upon their arrival to Mountainside Pool. Competitors had to use athletic and intellectual prowess to gain an edge on the competition. Biking between challenges, those with the ability to pedal hard made up time this way. Arriving at ACME, competitors had to find groceries that added up to $7.17 exactly. At 4 points throughout the race, the field of competitors was cut from 49 down to 24, down to 10, down to 6. Out of the 49 teams competing, only four were left when the competition wound its way to Glenfield Park. After rushing to construct a Big-Wheel and race it around the park, only three of the final four would advance to the final challenge. The final three teams had to toss each other water balloons in a tandem race to the finish line with a string tethering each team member to the other. Two teams, Crew of 2 and Sister Sleuths, were neck and neck at the finish line when both teams dramatically dropped their balloons and had to start the challenge again. That left the last team, Frick and Frack, who were a distant third to methodically relay their only water balloon across the finish line and into the winners circle. Team Frick and Frack made up of parents Sarah Young and Kelley Reynolds, who were also the first team to enter the competition. After the race, competitors, friends and members of the community gathered at Saint Peter Claver Church on Elmwood Street. The afterparty included food and refreshments for the hot and tired competitors and also a chance to converse about the race. Sponsors and donors gathered to contribute and congratulate. We at The Montclair Dispatch encourage all of those within our community that can donate to donate by visiting their website or by clicking through here. Education in our town thankfully never stops, but proper funding is required to maintain this wonderfully high standard of learning we have.